Tic Tac Trance #034 Replay available! This month’s Tic Tac Trance episode will be a 2 hours musical journey with a small amount of progressive & tech and a big part of uplifting, peak time, trance. You can expect new productions and remix by artists like Armin van Buuren, Ferry Corsten, Gareth Emery, Fast Distance, Adam White and many many more! 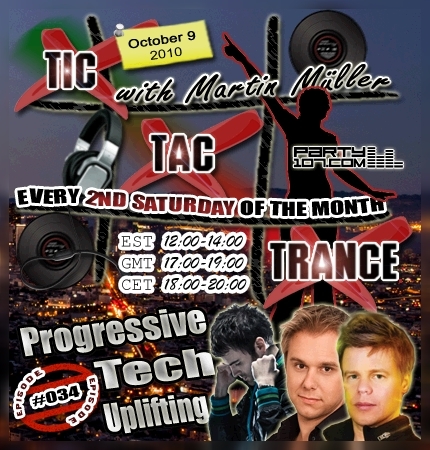 So don’t forget to tune in to episode #34 of Tic Tac Trance on October 9 2010 @ Party107.com! My show airs on TODAY at 18 CET / 17 GMT / 12 EST. Check out your local time HERE!